We have recently introduced the new TagPro system from Cableflag, providing a simple and innovative way to label your patch cables. The first consignment has just arrived in to the Patchsave warehouse, so I was keen to look at some of the advantages from this new name in flexible and robust cable labelling. The Cableflag TagPro product is designed and manufactured in Ireland and is a patent protected system. This was appealing to us, as so many of the other Datacentre cable labelling products that we currently distribute are either made in China or are from large US manufacturers. To spark up a relationship with a local, friendly organisation always fits well with our ethos, one that has a new quirky product is even better! We already provide adhesive wrap around and clip on cable labelling solutions that have until now served a purpose, but taking to market something different and new is always appealing. Recently, we have agreed to distribute and resell the Cableflag product range throughout the UK and Europe. The TagPro system consists of plastic devices (tags) and strong durable A4 perforated label sheets. The solution is sold in box sizes of 200 or 1000 tags to match your IT project size and fits snuggly around cables with a diameter of between 4-6mm. 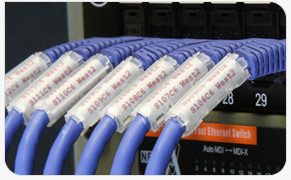 Therefore, this covers most Cat5e, Cat6 and Cat6a patch leads. The smaller box has 3 sheets of the A4 label card included, whereas the larger box is supplied with 10 sheets. There are 112 labels per sheet and the printing software is a simple 10 second download. Unlike traditional wrap around adhesive labels, these tags can easily be removed and then re-deployed. Once secured on to the cable, the TagPro can then rotate and slide up and down the network lead, this is great for high density patching scenarios and identification is much quicker than a clip on digit label or wrap around adhesive labelling solution. If you make a mistake you can simply remove the Cableflag label and quickly re-do the required change. The installation is fast and simple, you secure the TagPro in just a few seconds by gently tearing off the required label, inserting this face down and wrapping the tag around the cable, clipping it in at each end. It’s a nice secure fit, so not likely to be knocked off or lost once locked in position. When each label is printed it duplicates the sequence four times, meaning the label data is then clearly visible from most angles within your populated cabinets – high, low, left or right. If your view is obstructed slightly, then simply twist the tag around slightly. The TagPro has a small notch/lip to ensure that when snapped at each end securely in to place the label doesn’t slip out. The amount of movement really depends on the diameter of your patch cord, however we have found that the Cat6a patch leads are made from a thicker construction so they are a much tighter fit than for example a traditional Cat5e cable. The TagPro is less than 30mm in length. This makes it an ideal size, meaning it’s large enough to handle but not too fiddly when it comes to the installation. At the same time it’s a relatively slimline design so it isn’t bulky or prohibiting inside tightly spaced cabinets. What makes this labelling solution really stand out is the ability to install directly on to network cables in a live environment, so no need for scheduled downtime as the TagPro can quickly be added to any existing project. Alternatively, you could be really prepared and label up all your purchased network leads in advance of a scheduled installation – the choice is yours! Removal of the TagPro is just as easy. This is done by hand with no tools or blades required, saving both time and money. Seen as the Cableflag TagPro product is adhesive free you can then reuse both the tag and label again at a later date, with no sticky residue or cable wrinkles to overcome! The Cableflag free printing software is available as a download from their website at no cost. It’s unique online printing application works with any device or browser type. The A4 Sheets must be printed from a Laser printer as this ensures a high quality print with no smudges. The supplied A4 paper sheets are strong in design and have an equal border so it doesn’t matter which way round they are inserted in to the paper tray, meaning less mistakes and waste. From the software application you can change the required font colour, add in you preferred number and letter sequence, then select auto incrementing as required. You can then preview or run a test page before printing. 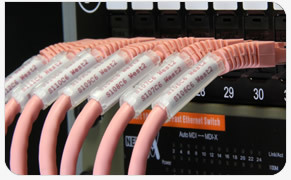 If you need a label for each end of the cable you can then simply create and duplicate this as a new sequence. We ran a number of test pages here at Patch HQ and found that with the default text size each label could comfortably take up to 12 characters/digits - keep in mind that this includes any required spaces and dashes. We did manage 14 characters before the software pushes down the sequence on to the line below, but when printed this meant that the Cableflag label print was extremely close to the perforated edges. Therefore, if this can be avoided the better the end result. Utilising two lines of data per label is not a problem though, the data would still be duplicated for you twice on each printed label, rather than the four times if you manage to keep the sequence on a single printed line. Where possible, we would always suggest that you utilise the full sheet (112 tags) to avoid wastage. This may mean you end up printing additional sequences or spares that can be used at a later date, as you will not be able to reuse and print from the A4 sheet again. It’s really important that once you print your sequence to a pdf, you first ensure that your laser printer does not have the ‘fit to page’ option enabled as this could misalign the final printed page(s). Most printers tend to have the default setting to ‘fit to page’ so it’s really worth stressing that this should be checked before your first batch of Cableflag TagPro labels are printed. When finished printing you can then remove the borders as indicated by the red arrows and then gently tear off the required labels. We would suggest that you fold first along the perforations before removing the labels to ensure a nice clean tear. If you prefer, we can print your own label sequences before despatch and if you happen to be ordering patch leads at the same time we are more than happy to supply them all pre tagged and labelled, ready for quick installation. To conclude, the Cableflag TagPro will save you time and is a fast solution to install. It’s ideal for Datacentres, Server rooms and Comms cabinet installations and is a simple and future proof labelling solution. A box of 200 equates to around £0.25p per tag, whereas the larger 1000 TagPro box is nearer to just £0.18p, with additional quantity breaks and free delivery available from our secure online shop at https://patchsavesolutions.com. 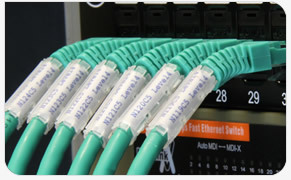 It you would like to try the product please email info@patchsavesolutions.com to request a free sample pack of these next generation labels for your network cables!